Geof Darrow is indeed a master at drawing details. The amount of details in some of his artworks is just mind-boggling, such as the one on the cover of this 128-page hardcover. Each drawing inside the book deserves to be studied slowly. You won't know what you are missing out at first glance. You have to look at all those tiny details, the attention to details, before you can begin to admire the level of respect this guy puts into his work. Almost every piece of artwork featured is at the oh-my-goodness level. In addition to checking out his amazing techniques, you'll also get to see his imagination and creativity when it comes to designing creatures, characters and scenes. 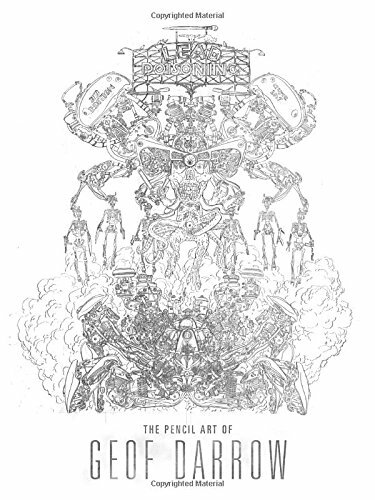 As suggested by the book's title, all the artworks in this book were created with pencils. I can only imagine the level of difficulty it requires to not accidentally smudge anything. If you look close, you can also see lines that were erased and being drawn over. This is an incredible book that's quite awe-inspiring. This is a pretty cool book. This is a pretty cool book. so detailed all the line's are perfect. takes year's I bet to master this work.